Amazing Dinosaurs! is an exciting new traveling exhibit that opened in May, 2016. 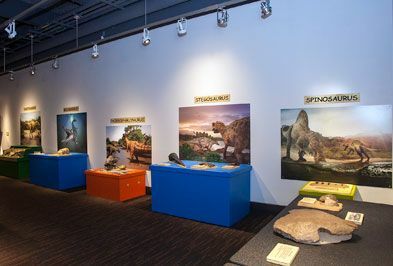 Designed for discovery/science centers and children's museums, the exhibit features majestic dinosaurs and their places in geologic history. A wide variety of exciting activities inspire young learners to discover how, where and when dinosaurs roamed the earth. 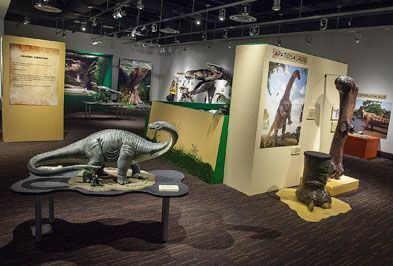 Featuring lifelike re-creations of popular dinosaurs, the exhibit immerses visitors in activities that cover the lifespan of these magnificent creatures, from birth to adult. 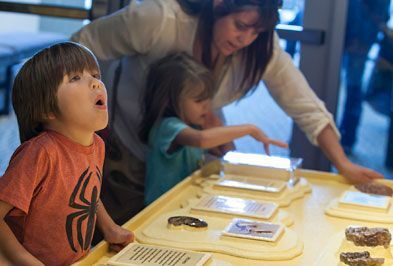 Discover which species lived first and last, dig for hatchlings and adult dinosaur fossils, explore a dinosaur habitat, and present how you think dinosaurs looked and behaved. Kids share their excitement with others at the dinosaur puppet theater and 'play the part' of a dinosaur by putting on fun costumes and participating in other engaging activities. Are there face-to-face experiences with a very realistic looking giant T. rex? Yes, and with a big raptor, too. Learn how they may have looked when alive and how their fossils look when discovered now. How big were they? Compare your foot to T. rex and make your own dinosaur tracks just as they appeared more than 65 million years ago. Large, colorful graphics highlight the dramatic forms and body features of your favorite dinosaurs. A variety of dinosaur fossils, casts and other learning tools are available for use by docents and other educators. Modular in design, the exhibit elements can be changed during the exhibition period. The exhibit can occupy display space of between 1,600 and 3,000 square feet. Amazing Dinosaurs!...It's About Time, And, it's available now! 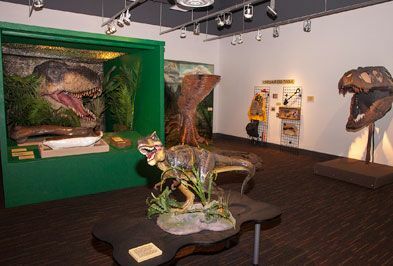 "One of the most interactive, kid-friendly exhibits the Flint Hills Discovery Center has had the opportunity to host." "Awesome fun, kids loved the Dinosaurs and all of the hands on activities." "We weren't even halfway through the exhibit and our attendance numbers were through the roof!" "The Antiquities Company staff were so friendly and easy to work with! Their enthusiasm and passion for the exhibit made it all worthwhile and we were so honored to be the first to host the exhibit." If you are interested in discussing the Amazing Dinosaurs! exhibit, we invite you to contact us at antiquitiescompany@gmail.com or call us at (616) 863-0880. We’ll be glad to provide current information about availability, specifications and lease rates. Amazing Dinosaurs - they're here!